A live bento box demonstration is among the activities at Delicious Little Tokyo. Foodies will flock to Little Tokyo this Saturday for the third annual Delicious Little Tokyo. The event, sponsored by Go Little Tokyo, features culinary workshops, food demonstrations, food tastings and one-of-a-kind activities at various local Little Tokyo businesses. • Floral Centerpiece Workshop, 10 to 11 a.m. Learn from second-generation florist veteran and owner of Kuragami Little Tokyo Florist how to make a beautiful, effortless floral centerpiece for any special occasion. Fresh flowers, vase and materials will be provided. $10 admission. • Camera Eats First: Food Photography Workshop, 10:30 to 11:30 a.m. Discover your inner foodie influencer and take your best Instagram photo yet with special tips and tricks from international foodie and Instagram star @LaPetiteBelle_Eats. $5 admission, pastries and drinks provided by BAE Little Tokyo with admission. • Indonesian Cuisine Demo & Tasting, 12 to 1:30 p.m. Spice up your foodie adventure and discover herbs and spices used in traditional Indonesian cuisine at Little Tokyo’s newest flavor hotspot, Kasih. for the ultimate food sampling and demo. $10 admission. 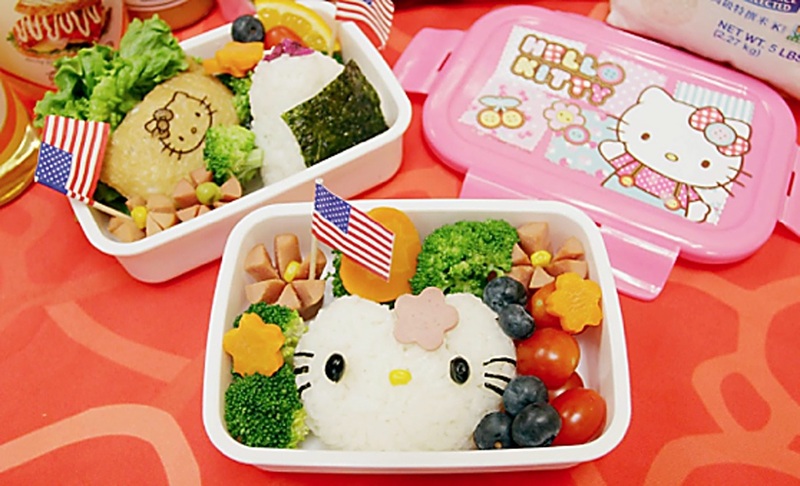 • Live Bento Box Demo, 1 to 2 p.m. Join former Mrs. Japan and Table for Two, a nonprofit organization that promotes healthy eating and helps hungry children around the world, to learn how to pack a lunch that is both delicious and adorable with kawaii (cute) characters. Free admission. No registration required. • “Furoshiki” Japanese Cloth Wrapping Workshop, 1 to 2 p.m. Learn the art of “furoshiki” cloth wrapping from Mike Murase, master furoshiki wrapper and director of service programs at the Little Tokyo Service Center (LTSC). Immerse in the rich history of these traditional Japanese wrapping cloths, and try your hand at this eco-friendly, fashionable option to package lunch boxes, bottles, and other gifts. $5 admission. Furoshiki will be provided by local Japanese goods store Bunkado. • Live Art Calligraphy Performance, 1 and 2:30 p.m. Watch +LAB Artist-in-Residence Kuniharu Yoshida as he uses his body and found objects mixed with hip-hop dance to create exciting, giant calligraphy artwork in public spaces. Free admission, open to all. • Food on First: A DIY Art + Film Workshop, 1 to 3 p.m. Join +LAB Artists-in-Residence Susu Attar, and Tina Takemoto at Matsumura Gift Shop for a unique collaborative art-making workshop. Play with your food and rediscover DIY art-making tools available in most home kitchens. Light refreshments and local snacks will be served. Free admission and family-friendly. • `Ukulele Discovery Station, 1 to 3 p.m. Explore a world of music with U-Space‘s `Ukulele Discovery Station, a DIY interactive learning and play-along musical experience. `Uke on with easy, familiar tunes and songs in a welcoming environment for `ukulele enthusiasts of all levels and playing experience. Loaner instruments available on-site. Free admission and family-friendly. • Windows of Little Tokyo: Halfway Reception, 1 to 4 p.m. Experience rich culture, live performances, delicious cuisine, and 11 artist installations displayed on storefront windows across the neighborhood during a walking tour through the historic, 134-year-old Japanese American neighborhood, starting at JACCC and ending at Aloha Cafe. Free admission and family-friendly. • Food and Sake Pairing, 2 to 3 p.m. Learn the history, cultural significance, and brewing process of various types of sake while indulging in signature dishes and bites from Little Tokyo’s newest Japanese-style restaurant, Sake Dojo. $20 admission. Must be 21 years or older to attend. • Donut Decorating Workshop, 2:30, 3, 3:30 and 4 p.m. Be ready to get your hands sticky and sweet while decorating your very own custom dulce donut to perfection with a variety of toppings provided by Cafe Dulce. $5 admission. • Pizza-Making Workshop, 4 to 5 p.m. Try your hand at making your own tasty pizza under the direction of Baldoria’s own Chef Duke Gervais. Intimate-sized classes include a journey through a pizza dough program and instruction on forming and cooking your own pizza. $20 admission. • Onigiri Workshop, 4 to 5 p.m. Join Table for Two and Wa-Shokuiku “Learn. Cook. Eat Japanese!” for an interactive and hands-on workshop to learn how to make rice ball characters, a fun and creative take on onigiri — the most popular Japanese snack. $15 admission. • Japanese Tea Ceremony, 5 to 6 p.m. Experience the beautiful, choreographic ritual of preparing and serving Japanese green tea, matcha, led by renowned tea master Soshitsu Nishimura of the Edo Senke L.A. Fuhaku-kai School. Matcha is provided by Tea Master of Little Tokyo. $5 admission.